For an obscenely long time, the Australian government seriously mistreated its Aboriginal population, much in the same way the American government treated Native Americans. 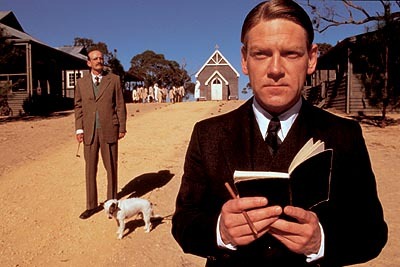 Rabbit-Proof Fence, based on the book Follow the Rabbit-Proof Fence by Doris Pilkington, recounts a very human story within part of the governments misguided attempts at 'mercy.' The film deals with 'half-castes,' or people who were half white, half Aborigine. The Australian government was in charge of the 'welfare' of all Aborigines, and half-castes were a special case because within a few generations of selective breeding, their Aborigine looks and skin tone would disappear. The government, under the care of Mr. Neville (Kenneth Branagh, Harry Potter and the Chamber of Secrets, The Road to El Dorado) would forcibly remove half-caste children and send them to what amounts to orphanages where they would learn to be domestic servants. Rabbit-Proof Fence deals with Pilkingon's mother Molly (Everlyn Sampi) and her amazing trek across Australia to try to find her way home. At 14, Neville decreed that Molly, Daisy (Tianna Sansbury) and Gracie (Laura Monaghan), three half-caste children, were to be sent thousands of miles away to a boarding school where they would eventually most likely end up as maids in some household. Molly decides to escape with Daisy and Gracie, and is smart enough to figure out that the rabbit-proof fence is the key to finding her home. The fence was constructed to keeps rabbits on one side and farmers on the other, and became the longest fence on Earth. Molly's home was thousands of miles to one side of the fence, and she was following it to get back to her mother. As this is happening, Neville enlists the help of the local police and of Moodoo (David Gulpilil, Serenades, Dead Heart), an Aboriginal tracker. The bulk of the movie is a desperate race across Australia, as Molly tries to evade the people chasing her and keep Daisy and Gracie safe. Christine Olsen's adaptation cuts straight to the heart of what drives people, the need for family. It is this basic human desire that is at the center of Rabbit-Proof Fence, and also what makes it so relatable across cultures. Together with strong, natural performances by Sampi, Sansbury, and Monaghan (none of whom are professional actors, director Philip Noyce (The Quiet American, The Bone Collector) creates a moving story by not over-directing. It's really moving watching the three young actors, mussed up by dirt, extremely hungry, and walking in tattered clothes, trekking across barren Australia. There is a minimal amount of dialogue, and Noyce is more content to let the actors actions and the landscape around them speak for themselves. 1 hour, 34 minutes, Rated PG for emotional thematic material.